If you’re travelling with Spirit Airlines on an upcoming flight, find out everything you need to know about Spirit Airlines Baggage allowance, restrictions, fees and charges. Spirit Airlines passengers are charged for both carry-on and checked bags. This is so that the airline can keep their ticket prices low. However, one personal item that fits entirely in the smaller sizer box (such as a purse, small backpack, etc) is included with your ticket. Anything larger, such as a standard carry-on bag or checked bag will need to be paid for. A personal item must be no bigger than 45 x 35 x 20cm. The fee for bringing a larger item onboard varies according to when the allowance is actually purchased. If purchased online during the flight booking process, the fee is typically $37. If, however, the allowance is purchased during online check-in, the fee increases to $45 as standard, it then increases to $55 at the airport or $65 at the gate. Carry-on baggage must be no bigger than 56 x 46 x 25cm. Need to purchase a suitable carry-on baggage case for your upcoming flight? We recommend this, available on Amazon, as they are approved by most airlines. Spirit Airlines passengers are not entitled to any free checked baggage allowance. Again, this is so that the airline can keep their ticket prices low for everyone. Checked baggage must not weigh more than 45kg or measure more than 203cm in overall dimensions. The number of checked bags you are permitted depends on your destination. Please visit the Spirit Airlines website for more information on this. 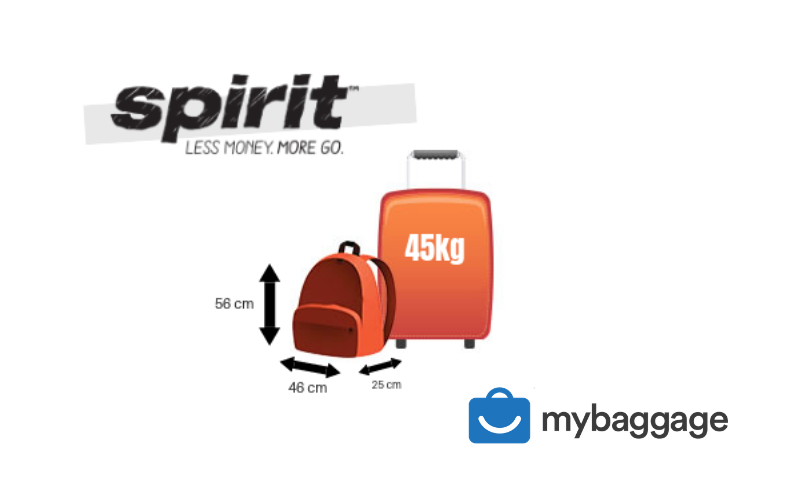 In terms of flight costs, Spirit baggage are an undeniably affordable travel option. However, the absence of free baggage allowance in order to keep their costs as low as possible does mean that you run the risk of increasing the cost of your overall trip if you have a lot of luggage to bring with you. This is especially the case if you exceed the permitted weight or size allowance or book additional baggage at the airport. Thankfully, there’s where My Baggage comes in. My Baggage allows you to ship a massive 30kg per suitcase at fantastic low rates. You’ll also have the option to pay extra for even heavier bags if you need to, and you can add as many items as you like to your booking. Shipping luggage with My Baggage allows you to bring more with you than if you were relying on a few checked pieces of baggage. 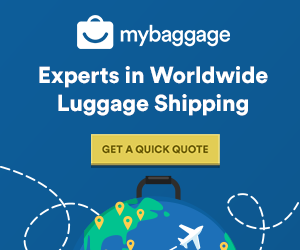 My Baggage provides a great low-cost alternative to airline baggage, with fast and convenient luggage shipping which allows you to travel hands-free. It means you’ll save yourself some time at the airport when you don’t have to check-in your bags, no waiting around at the luggage carousels on the other side and ultimately, one less thing to worry about whilst you travel. To give you that extra peace of mind, My Baggage offers £100 free compensation cover on every single shipment, which can be increased right up to the value of £1000 if you wish. Contact our support team if you have any questions!